Welcome to the official Street Dreams web site! Street Dreams By Ross, L.L.C.TM specializes in producing hinges for cars. We offer several different kinds of hinges, door, hood and trunk hinges well suited for production cars, kit cars, classic cars, trucks, SUVs. 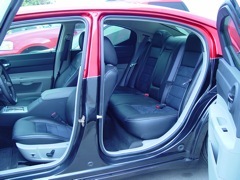 The hinges can be just to dress up a car, or to reverse a door to "suicide" style. The hood or trunk could flip up, to the side, to the front. Many of our hinges can also be assisted with gas springs or motorized. We can professionally install all the products that we sell, from the basic mechanical installation to body work and painting. Custom car shops interested in being listed as potential dealers or installers of our products should email us for posting on this web site. 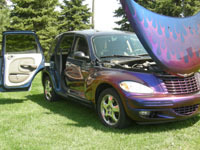 Experienced professional installer Ross DeMaagd can personally train people on how to customize cars or install our products into cars, trucks or other vehicles, in our shop or yours. Training is available on an individual basis or to small groups. Please call or email us for specifics. We do custom work pertaining to street rods, classic and custom cars. Talk to us if you would like your custom car work done professionally and with the proper equipment. We make custom parts on a regular basis to fit specific needs. Please see our photo gallery! Please click here for our street rod products and services. We have engine mount and adapter kits, flywheels, hood hinge and "scissor door" hinge kits available for Fieros and / or Fiero kit car conversions. Please click here for more information. We can custom build many parts from aluminum, plastic and steel, for auto and other applications. Street Dreams By Ross, L.L.C.TM has done sill plates, louvers, hinges, brackets, dress-up items, keychains. We also sell podiums, stage props, antenna masts and mounts. We can also put logos or engravings on machinable materials. Please remember that many logos are copyrighted and written permission should be obtained before contacting us. We have stock of hard-to-find aluminum tubing extrusions in 6061-T6 alloy, in round and square shapes. Please check out our aluminum page. We can sell the raw material and we can also custom machine parts to spec. Please contact us if you have any questions. We have map pocket compartments with built-in lights for installation into custom projects. For more information, please click here. Last updated 18 Apr., 2013.